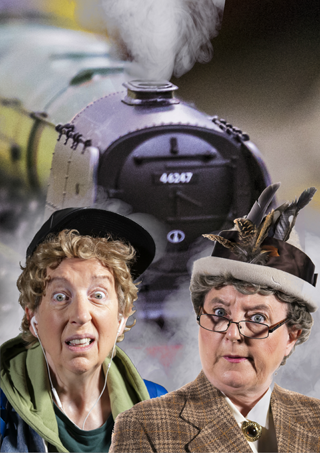 Strangers On A Train Set isn’t the first stop that LipService Theatre has made at Junction – they’ve pulled into Goole often enough to have built up a following. Before the play begins, the man sitting next to me asks if I’ve seen any of their previous productions at the venue. When I admit I haven’t, he tells me I’m in for a treat and compares Maggie Fox, who is one half of the two-woman company, to Tommy Cooper due to her ability to make him laugh without saying anything. He also jokes that after that endorsement, I’ll judge him if I don’t enjoy it, but it seems he isn’t the only avid fan in attendance.There’s a large and enthusiastic audience at Junction, who give Fox and her co-star and co-writer Sue Ryding a very warm welcome and happily join in during the evening’s one big interactive moment. It quickly becomes clear just why LipService has won people over as Strangers On A Train Set is a clever, hugely enjoyable show with dashes of inspired silliness. The idea is that two model train enthusiasts have come to Goole to present a scaled-down recreation of classic railway journeys. But while they may be keen to get all the details right on the locomotives, they are less concerned about using period-appropriate model passengers – which is how a 21st-century young man, a 1930s aspiring sleuth and assorted other characters find themselves caught up in spoofs of various train-based books and films. There’s no Hercule Poirot in Murder On The Orient Express, perhaps because even LipService couldn’t quite stretch to covering that with just two actors, but there are plenty of other nods to Agatha Christie. And if one parody leaves you cold, don’t worry, because unlike real trains, there’ll be another one along in a minute. For me, a computer game spoof fell slightly flat (although the reaction from the rest of the audience suggested I was in the minority) but their take on Brief Encounter proved a hit, thanks to Fox’s hilarious take on Celia Johnson’s clipped accent and repressed emotions. To move between the ‘real world’ and the train sets, LipService make liberal use of video and projection, and there are many ingenious touches. However, the actresses aren’t above poking fun at the show’s technical limitations, whether it’s the doll standing in for the third Railway Child or the jokes about the fact that two characters can’t share a scene because they are played by the same person. So, despite the fears of the man sitting next to me that he’d oversold it, I had a fun night at the Junction. In fact, the only disappointment came during the interval, when it turned out that an announcement about the stem-ginger ice cream for sale in the foyer was a set-up for a joke in the second act and not a genuine plug for Junction’s refreshments. We had to settle for vanilla. But then, how better to capture the spirit of British rail travel than by giving us a chance to moan about the catering?